I wasn't really wanting an FDE but I didn't really care either. I had just got an email from Kentucky Gun Co and they had Desert Tan for $479 which I thought was alittle high so I searched Gundeals and Wiki arms and G4G Guns had it for $415 and $15 shipping so that pushed me over the edge and I ordered it. Need to find a Kydex OWB holster, order a Vortex Venom or Burris FF3 and I will be ready for a range trip. I plan to shoot it in IDPA Carry Optics,GADPA (Our local club since we left IDPA) It is a blend of IDPA and USPSA. I have only shot two local USPSA matches and may start shooting it there. A friend told me I would be in "Hobo Open" division, also called Carry Optics! I worked as an SO at a IDPA match and one of the squad members was shooting this gun with a Vortex and one stage had a gun in box start and it fit the box with the optics cut out and looked like the 20 round magazines but I forgot to ask him later. Anyway I hope it works out well for me and I don't have any problems. I load my practice ammo slightly warm so I may not need a spring change but we will see. Looking forward to your thoughts on the SFx once you get some rounds down range. One thing about Canik, they have stiff RSA's. I contacted Century and received a reduced power RSA since I plan to run weaker ammo for competition. But when I get a new Canik, I always run a couple boxes of 124gr NATO through it first, and then I never have a problem with weaker ammo. I'm pretty new to competition though, so I'm still learning, and hopefully soon I'll start working up my own loads for it. As for the FDE, I actually like it. For carry guns I prefer black or subdued colors, but my SFx and Elite Combat are for competition, and the color has really grown on me. I just got 500 rounds of 124g Nato in today, but after my first miserable range experience with the SFX, I brought it home, racked the slide over 200 times and left the slide open for almost a week... Second range visit with 300 rounds of 115g I only had 4 - 5 stovepipes.... I may try and get out to the range again tomorrow with the 124 and do some more "breaking in". Second range visit with 300 rounds of 115g I only had 4 - 5 stovepipes.... I may try and get out to the range again tomorrow with the 124 and do some more "breaking in". Contact Century Arms and let them know you're having an issue with stove pipes. They will probably send you a reduced power RSA as well. I don't know why they put such a stiff RSA in a competition gun. I like the FDE since I bought the Combat. SFX looks nice in that color! The SFX height with the extended mag is 6.2". Inside dimensions of the IDPA test box is 8 3/4" x 6" x 1 5/8". You'll have to get standard base plates, or buy some standard 18 round mags. I bought std mags. I'm going to run it with several hundred rounds of the NATO stuff first... I't already loosened up 90%.. My first range visit was literally every single round would jam.... Second visit was 4 or 5 out of 300, and all with 115g stuff, so I may be getting close to that "break in" period. Pick up a couple of the cheap 124gr. WWB NATO packs from Wal Mart to break it in... Should be an awesome piece! Question: I only have black or titanium colored pistols. Is it true that the FDE doesn't get so danged hot when laying out on a range table in the middle of a southern summer? I'm not looking for IR temp readings, just a general opinion. Thanks! Is it true that the FDE doesn't get so danged hot when laying out on a range table in the middle of a southern summer? I've had black guns, brown guns, tan guns... All get pretty darned hot on the outdoor range during the summer... Couple of degrees difference dosen't matter, they all get hot as H E double toothpicks. Oh, I have nothing against FDE or Coyote or any other color (Not Pink). 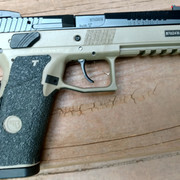 I have a Glock 19X in Coyote, I had a CZ P-09 and an FN FNS-C in FDE and I have a Glock 19 with FDE bottom and black top. I just was not considering FDE for the Canik but was leaning towards Tungsten but for the price I will like FDE also. Awesome looking P09. I got the 07 first, and liked it so much I had to get the 09. When I got the 09 a couple weeks ago, it was impressive right out of the box. One of the softest shooting handguns I've ever fired. I also recently added a Kadet for my P07, which is fun and saves me a little money not shooting 9mm all the time. Thanks for the heads up. Just so I know that if I ever go for an FDE it will be for looks only, not for any rumored functional differences. Anyone know where I can find one of these with 10-round mags at a decent price? There around if you look however the BIG sales were last month. You could try Grab A Gun. Tried there, and a number of other places. Can find the 20-round, but none thus far with the 10-round mags. Thanks for the suggestion though.